I love this beautiful Annunciation coloring page! Teach your children to honor Mary and the Archangel Gabriel with this triptych picture in stained glass style. I love how the angel is on bended knee as he speaks to Our Lady. This PDF prints to 8.5x11" single sided. I love this beautiful stained glass coloring page of the Annunciation, March 25! 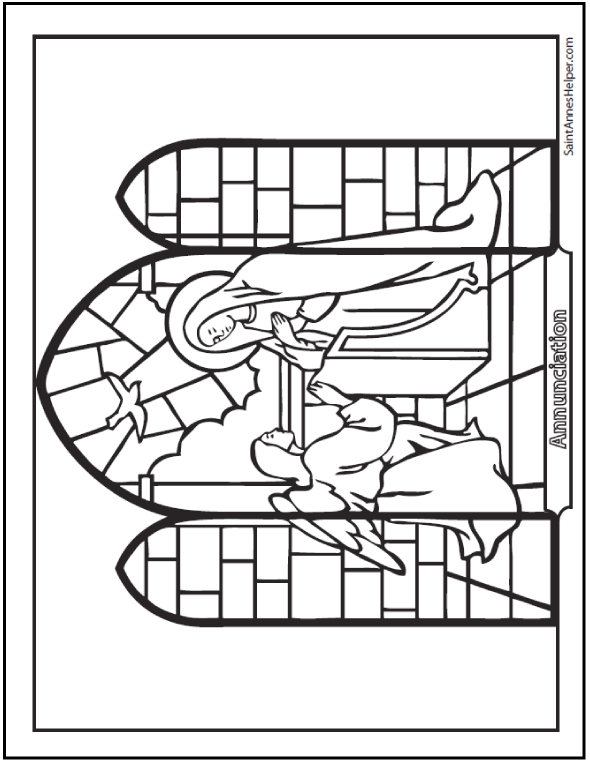 Use this coloring picture to teach about the Annunciation for Bible class or for the Joyful Mysteries of the Rosary. During Advent I love to use a Bible picture book like a family photo album to tell the story of Adam's fall, God's promise, and the fulfillment of that promise on this day. This means that the feast of the Annunciation is the same as the feast of the Incarnation, the day Our Savior came, March 25. Children love to see that the promise "came true". We also have a coloring sheet for Mary and the Angel and the Incarnation. If you are getting ready to celebrate the feast of the Annunciation, you'll like this theme. It's also good to teach about the Incarnation, the First Joyful Mystery, and the story of Jesus' Birth at Christmas. This coloring page is fun to color and cut to make a stained glass stand-up tryptic. If you print on light weight card stock or glue your picture to cardboard and fold on the side lines, the picture will stand up. It makes a sweet gift, too.